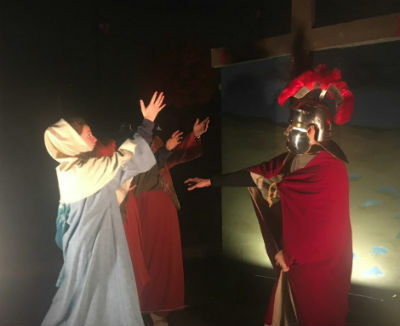 For the past eighteen years, Crossroads Church of God in Yuba City, California, has been hosting a Christmastime event that moves visitors beyond the manger. The “Miracle of Christmas” drive-through experience on the church parking lot truly takes the classic live nativity to a whole new level. Designed for car-fulls of people at a time to witness major incidents of Jesus’ life on earth from birth to death, to resurrection and ascension, the event reaches more than 8,000 people with the gospel in the span of just three evenings. Though the 350 volunteers may never know the total impact of their efforts, individuals often surrender their lives to Christ on the spot, and numerous families simply looking for a holiday activity make Crossroads their church home. They come because they saw the search light. They come because they’ve attended before. They come because they were Christmas shopping and wondered what the commotion was about. They come because the traffic jam on the highway forced a detour—a detour they were soon thankful for! They come because word has gotten out about this fantastic eighteen-year Yuba City tradition. And they come even when the weather outside is downright frightful. “One year we did it all three nights in pouring rain,” Pastor Jim Clark explains. “But all three nights it was bumper-to-bumper traffic. I was asked by the media if we were surprised by the turnout. I said, No, we expect them to come, and they expect us to be here.” Rain or clear skies, nothing can stop Crossroads Church of God from sharing the truth about Christmas and throughout the year. So, when skies opened up one year, Jim assured the volunteers they didn’t have to participate—but if they did, they’d supply raincoats for actors to wear under their costumes. When the evening was over, the drenched costumes may have weighed fifty pounds! Pastor Jim instructed the crew to hang them up high in the auditorium, turn the heat up, and assured them the outfits would be dry by morning. Lo, and behold! morning came and those outfits were dry. Perhaps this year’s miracle was that the weather on December 8, 9, and 10 couldn’t have been any better. 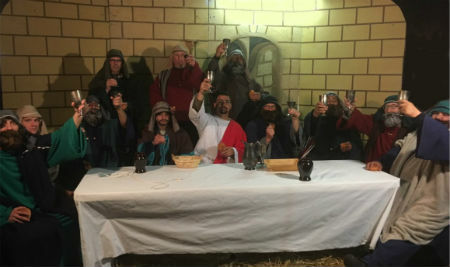 A scene depicting the Last Supper. 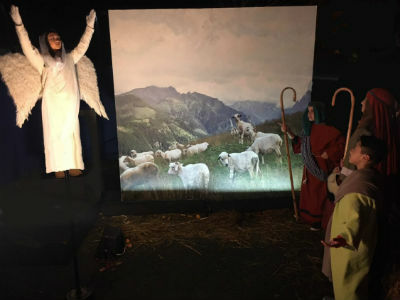 Here’s how the Miracle of Christmas works: from six to nine in the evening, drivers pass through fifteen different scenes, each one similar to a live nativity, but each one portraying a different moment in the life of Jesus when he walked the earth. Before each scene, the words of Scripture engage the viewers and prepare them for the next scene. Jim explains the importance of the Bible verses, as the “key of the Miracle of Christmas is to make the Word of God come alive.” When visitors enter under the Star of Bethlehem, the scenes are clearly Christmas. But when they leave, they’ve seen Jesus being taught in the temple, Jesus feeding people, Jesus healing people, Jesus being tortured and killed, Jesus rising from the dead, Jesus ascending into heaven, and many more scenes in between. The result is often an unexpected lump in the throats of those caught up in the hustle and bustle of the season, as they direct or redirect their attention to the reason for the season. Immediately after the final scene depicting Jesus knocking at a heart’s door, drivers are greeted personally by Pastor Jim and his wife. Yes, every car receives a greeting from Pastor Jim. Though they must keep the traffic moving, it is in these precious moments that stories of life change, salvation, or healing emerge. “Every year, something different happens,” Jim reflects. “A few years ago, a gentleman came through after being stuck in traffic and seeing the lights. He came to the scene showing Jesus healing a man and was struck by it. ‘If he could heal then, why not now,’ he thought. This gentleman, who was facing amputation due to diabetes, came to church a week later and shared what had happened. When he got to the end of the drive, a sense of warmth had come over him and he began to cry. He couldn’t compose himself, so he pulled his car over and stopped for a while. When he finally got home, he told his wife what had happened. She suggested he take his boot off. ‘What, now?’ he responded. But the man pulled his boot off anyway, and discovered his leg was completely healed. Scene depicting women and a centurion at the cross. Most amazing to Pastor Jim is seeing the reaction of the guests who come to realize the complete story of Christmas. After so many years, the addition of more scenes, and the growth of the event, it’s also rewarding to witness young parents who came through as kids now come through with their children. However they come, what matters is that they’re exposed to the gospel and seeds are planted. In California, across North America, and around the world, God is on the move in the Church of God. Join the movement. Reach our world. Donate today at give.jesusisthesubject.org. This entry was posted in All Church of God, Give Life, Western and tagged acting, CA, California, Christmas, community, Crossroads Church of God, drama, healing, holidays, Jim Clark, live nativity, outreach, salvation, theater, Yuba City. Bookmark the permalink.